Over at the County Library, there was a box of books for sale for 10 cents each! In the box I spied the book, "Seabiscuit". I just love the movie about Seabiscuit. I believe that I blogged to you about how I feel about Seabiscuit the movie. Also, just a couple of days after beginning my great adventure with MsTioga in June, 2003, I visited the ranch where Seabiscuit had lived in Willits, California! Book better than the movie! As soon as I began to read the Seabiscuit book, I found that I could not put it down! The book covers Charles Howard, Seabiscuit and the others so much better. 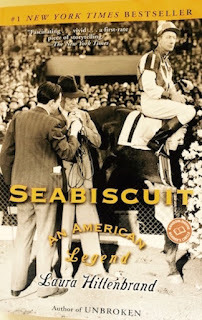 You might enjoy the PBS documentary, Seabiscuit - American Experience. I did.